We are a full-service company that develops and manages Sales Centers nationwide. Whether it is a “members only” fee-based center for a single company, or a quick package pickup station for multiple vendors, we can build a model that suits your business. Our services are based on a Build-Operate-Manage philosophy. This approach is a time-saving and cost-effective way for retailers to enhance their business by expanding to physical locations without the traditional investment in real estate and location development. Cura Group was created to fulfill the needs of direct sales businesses wanting a brick and mortar presence in a market, who don't necessarily have the resources or interest in developing and managing real estate. 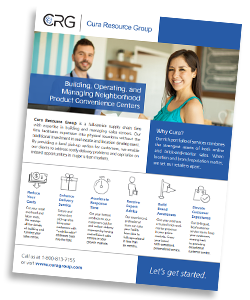 Let's talk about your distribution strategy and find out how we've helped companies grow their business by utilizing a local brick and mortar Sales Center. Cura can help grow your business and give your customers access to the hottest products!